I know I’m not dropping a bombshell when I tell you that limousines are incredibly popular for Hen parties and have been for a while. They are are frequently used to transport partying groups of girls to and from their Hen Weekend Activities and rightly so. But where has this popularity stemmed from? In fact, who first decided to take a perfectly good car and stretch it and why? Here at UKGirlThing, as well as offering Hen Weekend Activities, we’ve also been doing a bit of research and we’re about to give you a brief history of limos on why they are so popular. The name ‘limousine’ originates from a region of France where the shepherd inhabitants wore a type of cloak and hood which later resembled the covering of a carriage. Much, much later, around 1902, the word limousine was used to describe an automobile where a permanent top extended over the external drivers compartment. The 1st stretch limousine was created in America in the 1920s. They were created in order to transport the ‘Big Bands’ around with all of the musicians and their instruments, they were often referred to as ‘Big Band Buses’. Over the years several, car manufacturers have produced luxury stretch limo vehicles for a variety of reasons and uses. More recently, many have taken popular standard luxury cars and extended their wheel base converting them into novelty cars. Even come of the more obscure cars have been stretched such as Mini Coopers, VW Beetles and even Ferrari’s. Hot tubs, TVs, bars, telephones and disco lights are just some of the exotic luxuries that have been known to be installed inside these vehicles adding to the levels of luxury and comfort. 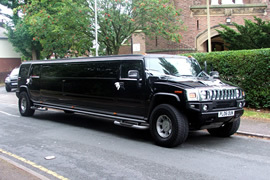 It is these advances in the novelty limo market that has seen their popularity in the party market increase. Previously they were only afforded by the rich and famous – royalty, Presidents, film and pop stars. But the rise in limo companies offering limo hire on a daily, or even hourly basis has made them available to people of all walks of life. It is the link to the luxury and extravagance of limousines that make them the perfect addition to hen parties and weddings. If you can’t treat yourself to a bit of luxury on these occasions then when can you?! This blog was written by Rebecca Lee of UKGirlThing.co.uk. The UK’s Number 1 Hen party planning company.